While Abbott and Costello’s “Who’s On First” is probably the funniest comedy skit in the history of mankind, the following has similar overtones when dealing with a much more serious problem. There are some people that, no matter what I’m doing when I hear them, I have to stop and listen. On the short list, very near the top, is Mohamed El-Erian of bond investment giant, PIMCO. No matter what the crisis, there have always been people that have said “this time is different!” and they’ve invariably been proven wrong. Time and again we think we’re faced with situations that have never occurred before only to be shown “this time” has happened frequently. After all, there’s nothing new under the sun (Eccl 1:9). So when someone like El-Erian says, not quite that, but comes pretty close, I have to wonder. The major take away here, and something he wrote last week after the EU bailout was announced, is that we’re in a place we’ve never been before. “The Greeks would rather kill each other in the streets than work and pay taxes.” – the author quoting a friend. Comments Off on They Blinked BIG! Wow! I wrote that post yesterday just minutes before the news began leaking about a 500 billion euro bailout of ALL of the PIIGS (Portugal, Italy, Ireland, Greece, Spain). I should have guessed that socialists can’t allow failure even when it’s brought on by the willful ignorance of an entire populace that deserve the poverty that was looming over them. Instead this action will socialize the pain by stealing from those that are productive. When the revolution comes … I hope I have a camera. Comments Off on They Blinked! According to a few articles today the EU and the IMF (read “US”) are going to announce a new bailout of Greece. This one apparently is for immediate disbursement (read “no need to actually complete the austerity programs”). That means that the whiners and thugs that pass for the Greek populace have now intimidated the EU into submission. All two year olds should learn a valuable lesson from this. If your mother is someone like Angela Merkel, tantrums work. This is a perfect demonstration of moral hazard. 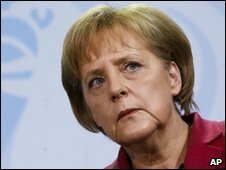 Apparently the German people are not thrilled; Ms. Merkel is in danger of loosing her majority in Parliament. Having spoken to several German’s about this issue, it seems to me they’re not ready to pay for the much better benefits, much more generous pensions, earlier retirement, much worse corruption, and a higher percentage of people working directly for the state. Does the population (of Greece) have the internal will to actually make the tough collective choices that need to be made to get this state back on track. And I think the early returns from Greece are very distressing. We see, in that awful case in the bank [where three people were burned alive in the riots] signs that the population just doesn’t get it. Let’s face it, the cowards in the EU blinked, kicking the can a little further down the road. The failure of European socialism may have been delayed a few days or months, but when it finally comes it’s going to be massive and now even more cataclysmic. Comments Off on What else needs to be said? Having a monetary union without a fiscal union doesn’t really work in the long term […] What you do is you have some kind of central tax and spending mechanism which takes tax revenues from faster growing parts of the monetary union, and spends those revenues directly in the weak parts of the monetary union. By the end of the interview he was quoted as saying that the German people shouldn’t be upset about bailing out the Greek pensioners. The mind-numbing lunacy of the socialist mindset is stupefying. You are currently browsing the archives for the Economy	category.